It’s just not what my blog is about – there are many sites that do a great job reviewing books, and I love the “wisdom of the crowd” effect you get from customer reviews on sites such as Amazon.com, so I don’t feel the need to add my own voice to the book review universe. 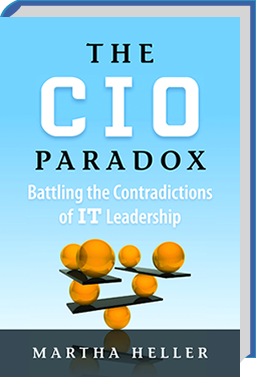 Notwithstanding the above, when the request to review The CIO Paradox by Martha Heller came in, it was accompanied by sufficient clues as to its content (including a table of contents and a sample chapter) to convince me I’d enjoy reading the book, and have no problem creating an honest review. It also helped that I was familiar with Martha’s writing for CIO magazine, including her first article on the CIO Paradox back in 2009 – a piece that resonated strongly with me from my work with CIO’s. I suspected this book would be of value to my readers. You were hired to be strategic, but spend most of your time on operational issues. You are the steward of risk mitigation and cost containment, yet you are expected to innovate. You are seen as a service provider, yet you are expected to be a business driver. IT can make or break a company, but CIOs rarely sit on corporate boards. You run one of the most pervasive, critical functions, yet you must prove your value constantly. Your many successes are invisible; your few mistakes are highly visible. You are intimately involved in every facet of the business, but you are considered separate and removed from it. You are accountable for project success, but the business has project ownership. Your staff is most comfortable with technology, but must be good with people. Your staff is doing more with less, but must make time for learning finance and the business. You develop successors, yet the CEO almost always goes outside to find the next CIO. You are forced to seek cost-efficient overseas sourcing, yet you are expected to ensure the profession’s development at home. Technology takes a long time to implement, yet your tool set changes constantly. Technology is a long-term investment, but the company thinks in quarters. Your tools cost a fortune, yet they have the highest defect rate of any product. You sign vendors’ checks, yet they often go around you and sell to your business peers. For each paradox, Martha shares leading and interesting practices from CIOs. She names names, and writes clearly and insightfully about approaches that have worked – some simple, some more involved. This makes for an easy and interesting read. It also provides a comprehensive compendium of improvement ideas to consider. Which CIO Paradox have we made the most progress on solving? What were the keys to our success? Which CIO Paradox seems like it is the toughest for us to solve, and why? Which practices suggested in the book should we be implementing, and how? A variation on this theme would be to share the book with senior business executives, and run the retreat with them – perhaps as a prelude to a business-IT strategy/roadmapping process? That could open up some invaluable dialog! Reach beyond IT. CIOs are picking up new titles left and right. We see “CIO and VP of customer care,” and “CIO and VP of strategic planning” all the time. Whether they take on an additional title or not, it is time that CIOs apply their leadership far beyond the IT organization. Move closer to the revenue. When technology data is directly related to a company’s products or services, the CIOs of those companies have a shot at driving revenue. To view the table of contents, advance praise and a sample chapter click here. Vaughan, thanks again for reading and reviewing my book!